Breakfast, lunch and specialty coffee. Everything was great except for the green tea. As a non-coffee drinker, I really enjoy my green tea in a cafe (because it's much tastier and stronger than from a teabag), but on this occasion, it was so weak I could hardly taste it. The tea leaves weren't left in, so it just got colder and not stronger. I asked for a new one and was given a proper pot, but it was lemongrass tea! So while everything else was wonderful (food, service and atmosphere are great), the tea experience was a disaster! Technical malfunction / or they forgot to order our food - so the wait was long. A few people had mentioned Top Paddock to me and I was pleased to be able to book for brunch on a Saturday. This page does not do them justice, Top Paddock manages to be a beautiful setting next to a busy road with friendly staff and tasty dishes. My friend and I sat outside and thought the Hazelnut Espresso Martini was a great way to start our meal! We both had the eggs benedict with beef brisket on a potato rosti served with jalapenos and a very good Hollandaise. We opted to add half an avocado to share, this came with lime & ash salt and letting those ingredients infuse together resulted in a perfect accompaniment. We had ordered our eggs to be cooked differently and unfortunately when they were brought to us we were advised incorrectly but no major drama. Looking forward to returning! Great service, tasty food. Chilli scramble is a must try. Coffee is also very good. Really friendly Waitstaff, great location and atmosphere. Food was delicious and coffee were spot on. I booked a table outside as we had a fluffy with us but when we arrived the table was booked inside. Luckily the restaurant was not busy at the time and we were given a shared outdoor table. Food was okay. The hotcake was huge, v.pretty but too rich, stoggy and sweet (the hot cakes were presoaked with syrup). The chilli scramble was interesting but will not be ordering it again. The atmosphere, decor/indoor outdoor area was good and the staff was very friendly and attentive. I had the Heirloom tomatoes with the stracciatella - a match made in heaven. Best meal I've had in a while - we're going to do it at home. Food was great and awesome service. 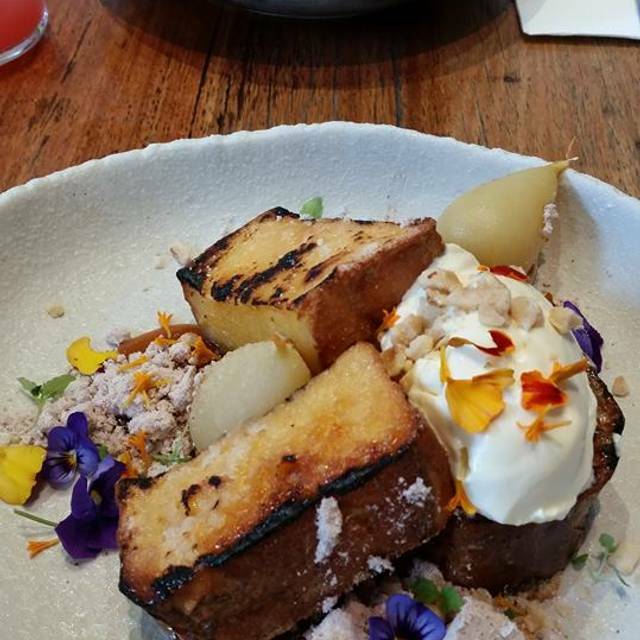 My french toast was divine, an amazing balance of flavours and the best brunch out I have had in a long time. My friends blueberry pancakes was one single pancake and was extremely thick and stodgey, she was unable to eat them and was quite disappointed. Described as "a vanilla cake with not enough to cut through the sweet." All other food coming out of the kitchen looked amazing. Attended with a large group of 17. The staff were very accommodating with seating, were friendly, good lively atmosphere and the food was excellent. Highly recommended! 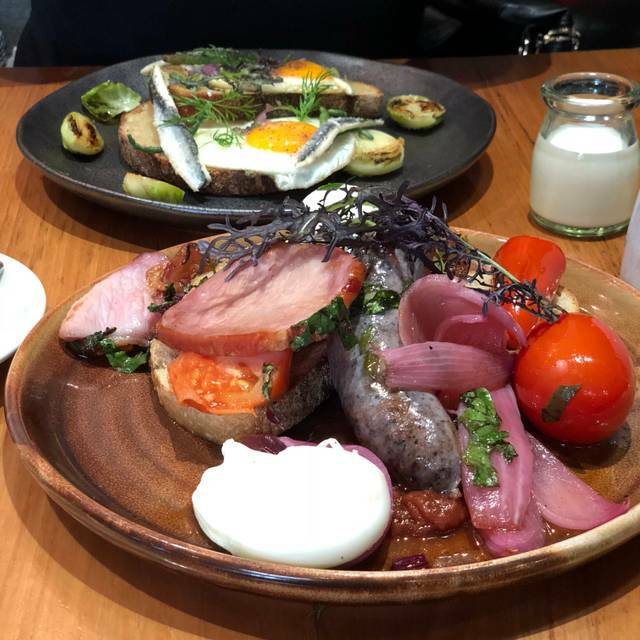 LOVED the Top Paddock, a recommendation for breakfast on our visit to Melbourne from Adelaide. Everything fantastic... just too noisy and struggled to hear each other. AMAZING! - Brulee French Toast a must try for anyone. We booked a table but ended up on one end of a communal table. This has happened before and frankly you should specify if the table is not really a table when the booking is made. The communal table we were on was quite wide and we had to shout across it to talk to each other. Great food but terrible table which should not have been classified as a table on the booking. Would put me off booking this way next time. Food was exceptional. Staff were very attentive to everyone's needs. Great place to eat breakfast or lunch. Very nice food and the desserts taste lovely. Food is made with different flavours.an tastes very nice. Amazing hotcake and Beef sandwich! I wish I could have the recipe to the hotcake! Poor service. Uninterested staff. Forgotten coffee orders. Super loud. Staff appeared to be chasing their tails. Limited lunch menu, more breakfast/brunch. Standard pricing for the type of venue. Visiting from Adl and enjoyed top paddock on our last morning. Delicious food, gorgeous food and unique restaurant setup. Loved the zero waste menu. Great would be a understatement. :) food was fantastic, service matched just a great place to visit. I was disappointed with my choice of a kale salad with beetroot and fennel. A huge bowl of kale and a tiny amount of beetroot and fennel. Almost inedible. My friends hot cakes were very good. The service was rushed and not particularly friendly. I won’t return in a hurry. The food and ambience was great however the experience was a little let down by the service. We were sat in a corner and staff would just walk past without checking in on the section. We had to actively look for someone to take out order. Otherwise, place is great and I would recommend it for a Brunch session. 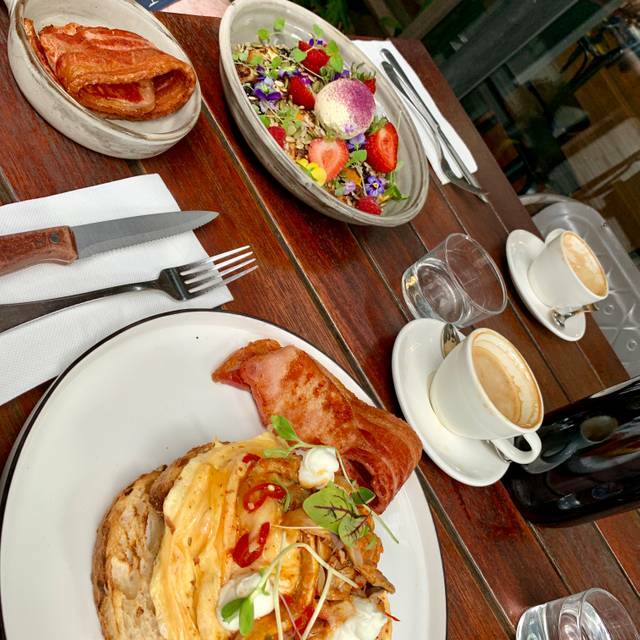 We went for brunch on Saturday and it was good but nothing special. The food was a bit above average and the staff seemed slightly dis-interested in us. Had heard great things about Top Paddock being one of the best brunch spots in Melbourne but would completely disagree. We left very disappointed. Took my partner here. It was amazing! Everything was amazing!! Just my only complaint was everyone who ordered eggs said that toast was way to hard and the couldn't really eat it as it was so hard. But apart from that everything was amazing! Delicious with a great vibe. Love the concept of no waste too. Recommend to everyone to try this option. Overall experience was good. Food and coffee was good. Only thing was, they had ran out of Turkish bread and had to substitute using sour dough, for the beef brisket roll which was disappointing. Top Paddock. Delicious, wholesome food well done. Coffees are fab although there’s a long wait (Eg. 15 minutes) during peak times. Went to Top Paddock with a friend to try out lunch at cafe. Choice of food on the menu was ok but not fantastic. Quite disappointing. We have been to other cafes that offer similar if not higher quality food than Top Paddock. Serving is small and price is similar to other cafes in Melbourne. Ambience is only ok but not super great. Staff was good and quite attentive. Well presented clean, healthy food. Friendly attentive staff. Thanks for a great lunch. We arrived half an hour early for our reservation on a cold morning, and the staff had thoughtfully reserved a table inside for us even though the reservation had been made for outdoor seating. The waitstaff were attentive and friendly, and the food was delicious, portions very generous! Great food, amazing menu with lots of interesting options!